March 2, 2017 March 1, 2017 Amanda B. When teaching new math concepts, or reinforcing learning that has already happened, kindergarten students learn when they are having fun. I made these two new centers with that in mind, to make sure that our students would not only be learning, but will also be having fun while doing these centers. The first is using a number line to work on addition and subtraction. They have a number line and task cards and they must find the answer. Our students enjoyed using a different tool to be able to add and they loved the idea of ‘buzzing’ or ‘hopping’ along the number line. 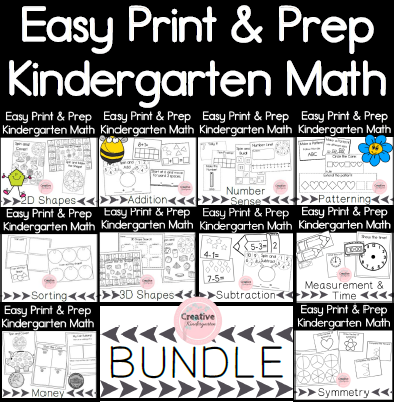 It’s also an easy center to set-up, once you have printed out and laminated all the cards and number lines, they are completely reusable. There is also a recording sheet to use if you would like your students to write out their answers. Next is an awesome pack that has 11 different activities that can be used with the different spinners that are included (numbers, tally marks and ten frames). Students can play different games and work on different math concepts at the same time.